If it was only this easy! Power is one of the most talked about topics among those interested in converting a van, trailer, etc. into a dwelling. A secondary automotive 12 volt and a residential type 110 Volt AC power system is something all vandwellers are likely to consider and/or install at some point. I would venture a guess that 90% of us use one or more extra batteries to power every day items such as TVs, VCRs, alarm clocks, radios, CPAP machines, etc. It really does add all the comforts of home to your rolling house! To add electricity, it can take a fair amount of time and money. Some do it simply (as did I) by concealing orange extension cords and using power strips. Some make a full blown wiring system that looks professional and costs a bundle. In either case, there is a least common denominator – you need a few common pieces of equipment. I spent about $2800 to buy all of the electrical and electronic gadgets needed to put together a pretty robust 12 volt and 120 volt power system. A person can forego the generator and scale the equipment back considerably easily making due for just a couple hundred dollars. A lot of research was done on Amazon.com and that helped when making choices. Thankfully, there was little re-work needed. Nonetheless, plenty was learned along the way. What follows is a description of each major piece of equipment purchased for the van and how it’s actually performed “in combat”. Please bear in mind that these are simply opinions and experiences, just like the Amazon reviews. Nonetheless, I hope they help a few of the newbies who want to give this lifestyle a go. It is something you can start slow at and accumulate the needed parts along the way. Note – These are just a few van purchases specific to powering things. In the future I anticipate posting other reviews but for now just the power handling items are shown. Deep Cycle Batteries are the heart of the electrical system for a vandweller. The Trekker Van uses two Powerstar brand, group 4D 12 Volt batteries, one behind each front seat and wired in parallel using the seat mounting bolts for ground connections. The batteries are sealed AGM type and are rated for about 230 amp hours (per battery). So far the performance has been perfect after about 18 months. Though much more expensive brands and options exist, these have served well so far. Two thumbs up for lots of reliable power! I would buy them again! The battery charger for the van is an Iota DLS-55 IQ4. When it works, it works well. Unfortunately it’s in the shop for repair right now. Three of them have died in the last year and a half. When it functions, the Iota does a great job of charging the battery and throttling back to a maintenance charge. Just make sure and get the IQ4 version (which adds the automatic third stage of charging) to prevent overcharging and destroying the battery. One thing to note … Due to its design (with large filter capacitors), the DLS will create quite a spark when first plugging in the 110V power cord. The factory says that is normal. In terms of performance, I give it a thumbs up but for reliability, I give it thumbs down. I would not buy the Iota again unless planning to keep an extra one ready at all times due to the problems experienced. When the Iota charger is broken (quite often), I occasionally have to rely on this little Schumacher XCS15 battery charger. Even though the van has solar to charge the battery bank during the day, the constant 3 amp current drain of running the Koolatron food/pop cooler can pull down the house batteries. The little Schumacher helps keep them topped off. It also saved my tail a couple of times after draining the van’s starting battery too low to start the engine. I just plugged the charger into the Honda generator for a leisurely charge and ten minutes later was back on the road. I love this little critter and would buy one again in a heartbeat but this one just won’t die. Do keep an eye on how it’s charging. If you have a constant drain on your battery, the charger might shut itself off when the batteries are full and not know to turn back on again as the batteries’ voltage drops a bit. No biggie though. I still give it two thumbs up for price and reliability. It’s never failed and costs only 1/4 as much as the Iota! Here we have a Cobra 2500 watt inverter. I’ve gone back and forth on whether or not this was a good investment. So far it’s worked perfectly. The remote control switch is mounted behind my head at the back of the headboard. It is convenient and reliable. The 110 volt modified sine power has always run the TV and DVD player, various chargers, my razor, etc. without fail. The reason a large inverter was chosen was in case I needed to run the microwave from the house batteries. In reality, the microwave is seldom used for cooking (just storage!) unless near shore power or if the Honda generator is turned on. The microwave does not like the modified sine wave pattern and it makes the motor growl angrily. You’ll want to run a microwave on pure sine wave power. 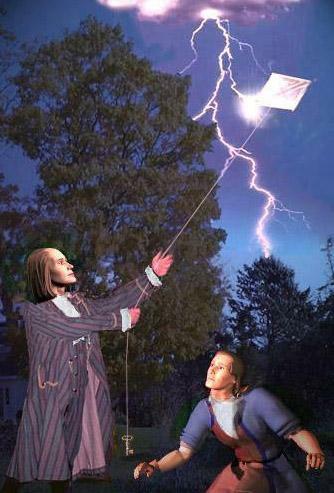 Reliability for the inverter has been perfect. 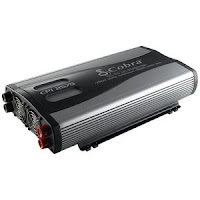 Even though the Cobra deserves two thumbs up for performance and reliability, the next time around I would probably buy a smaller pure sine inverter. Next to the batteries, the best power-related investment has easily been the addition of a solar panel to the roof of the van. 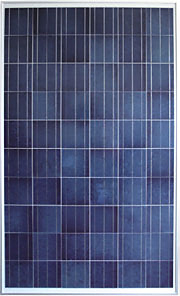 I chose the Astronergy 235 polycrystalline panel and bought it through the Internet. If you live in Arizona or California, there are many local dealers. This one had to be shipped in by freight truck and the shipping was pricy. The panel runs at 29.16 volts or so. 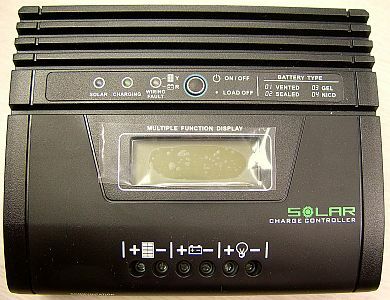 To recapture as much energy as possible, it is connected to an MPPT charge controller. I often see 13 to 15 amps being pumped into the battery bank during peak daylight hours. The 235 Watt rating seems to be a bit conservative. This panel lives up to its numbers! It is not unusual to realize well over 200 watts of charging power during the afternoon. Reliability has been perfect and the solar panel has stayed in place at speeds of 70 MPH with very strong crosswinds. With free electricity, solar has opened up all kinds of places to camp without the need to pay fees! Two thumbs up for this rugged, dependable solar panel. Since the solar panel runs at 29.16 volts, it was necessary to buy a charge controller to bring the voltage down to something usable. The problem is that many chargers simply discard anything above 14.3 or so volts, thereby wasting a lot of power on certain types of panels! The MPPT type charge controller converts the extra power to more current at a lower voltage. This is the MPPT 200, a little Chinese charge controller available on Ebay for about a hundred bucks. I was apprehensive about buying it but thought “What the heck?” It has performed flawlessly and paid for itself by consistently charging the batteries everyday. The only bad thing I can say is that it’s a no name Chinese product so the jury is out as to whether not it will have a long lifespan. Even that being said, this little solar charge controller (which I mounted behidn the passenger’s seat) has been reliable and I would buy it again. The digital display is helpful. Two thumbs up for affordable, outstanding performance! If buying a generator, don’t skimp! The price might hurt a little now but you will be glad you spent the money. There are a lot of six hundred dollar generators out there but you get what you pay for. They might run well for the time being but cheap generators don’t last long. Hondas and Yamahas do. The Honda EU2000i was an excellent investment. 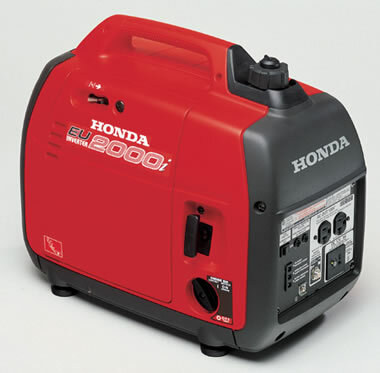 Though it says 2000 in the name, the generator is actually rated at about 1600 watts continuous duty. That is sufficient for this camper’s needs. I can even power the portable A/C (with its compressor cycling) in the van so long as the generator’s economy mode (eco-boost) is not switched on. Reliability has been perfect and the gas usage is very low. The noise level is quite low and doesn’t bother nearby campers. The Honda is not exactly light – it takes a little effort to get it in and out of the cramped van. It doesn’t have to be secured because it is so heavy (and sits in a confined area) and it never tips over. The generator starts on the first or second pull and runs smoothly. For its performance, reliability, ease of starting, quiet running, I give it three thumbs up. Just keep an eye on it. Hondas are so popular that they have been known to vanish. An onboard voltmeter is invaluable. Some time back I made a post discussing this acquisition. Little did I realize that it would be checked many times per day and night. It was purchased with the intention of just monitoring the house batteries’ status. (12.7 volts = full, 12.5 = 90%, etc.) Now I find that the voltmeter is helpful all the time. Depending on the charging voltage coming from solar, I can tell if it’s sunny outside or watch the level fluctuate with passing clouds. If the house charger is being used then I can see what state the charger is in (such as bulk state as pictured here). The cost for the voltmeter is about $20 including shipping. Just cut a hole in the wall or make a little box to put it in. 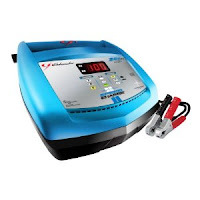 The wiring is simple and the voltmeter is easy to calibrate. Two thumbs up for being an inexpensive, invaluable tool! Equipping a van to cover all of your electrical needs is not necessarily cheap. There are a number of different ways to do it and a lot of good (and a few bad) products out there. Check Amazon’s reviews. For many items it is more cost effective to buy them online and save the taxes (where applicable) and shipping. Look for items with many reviews. In general if a number of people complain about the exact same problem with an item (I.E. “the cheap handle fell off in two days”), then seriously consider that feedback. Hopefully I won’t need to attend Solar Addicts Anonymous “SAA” by having too much solar. Wow! That’s going to quite some solar array! Do you also then have a large battery bank? If so, how large? Ice cold A/C is a good thing. I’ve been using a 9,000 BTU A/C that is cold enough to freeze the bal*s off a brass monkey. It has to be run off shore power (or generator)… I don’t have the real estate for a large enough array to run the A/C. It will be cool to watch the progress of your “Over The Top Cargo Trailer”. It’s really going to be something! Im about 90% done with the trailer , just some tweaking left to go etc & then install the larger panels, who knows how long that will take as I still am lucky to have a job :-)). I don’t know much about boon docking or RVing , but you seamed to have jumped in a survived ok, it remains to be seen if I’ll become life long boon docker ie my term Coyote Camper out in the boonies. You never know what comes in life ?? I also hate Cheap trailers- RV’s & RV salesman as they are both full of crap & really built cheap, unless you have a $100k. So I decided to build my own …..time will tell how that turns out. Already Wish I had higher clearance and 4 x 4 drive already. But that is how I got started on the crazy project.